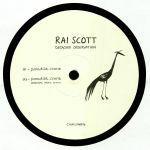 Review: This fine outing on Church marks the return of Rai Scott, a woman who knows a thing or two about crafting quality deep house. Despite it being three years since her last EP, Scott has lost none of her production powers. For proof, check the dreamy lo-fi wooziness of "Paradise of Crane", where deep space synthesizer chords seemingly float around a clicking deep house groove, the cinematic bliss of "Lazy Sunshine" - "Deep Burnt" for a new generation, perhaps - and the lilting, enveloping dancefloor melancholia of "Detached Observation". Also worth checking is Valentino Mora's fine remix of "Paradise of Crane", which recasts the track and a slowly shifting chunk of head-in-the-clouds deep house/dub techno fusion.